To ride through the wilderness is a real treat. So too is the end of the day when the excitement can be relived over a glass of something cold. 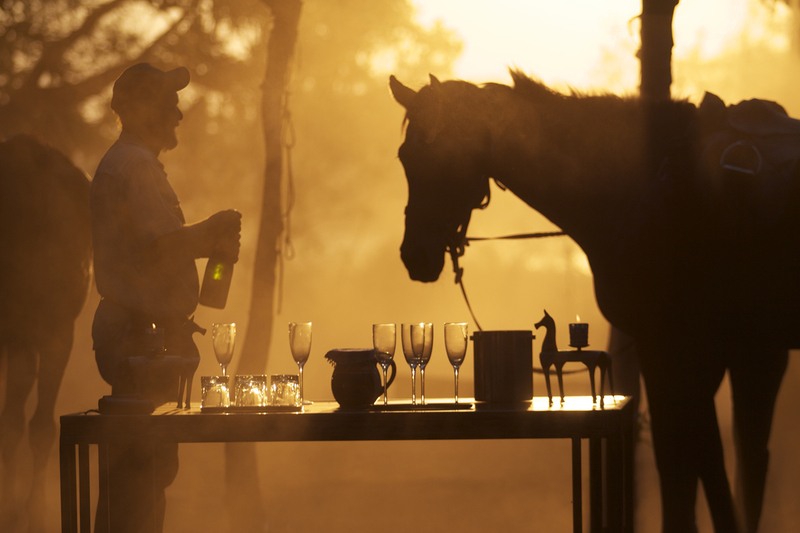 This shot taken at Okavango Horse Safaris in Botswana perfectly captures the atmosphere. Africa’s beaches rival any of those in the Caribbean or South East Asia, and those found scattered on islands in the Indian Ocean are among the best in the world. 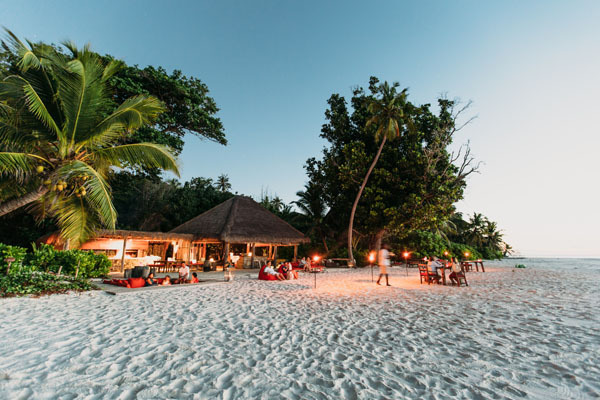 Celebrity favourite North Island, a private tropical paradise in the Seychelles, has miles of exquisite shoreline with plenty of perfect spots for sundowners. Botswana’s Okavango Delta is a unique paradise – a pristine wilderness area full of wildlife, tiny islands and hidden channels. 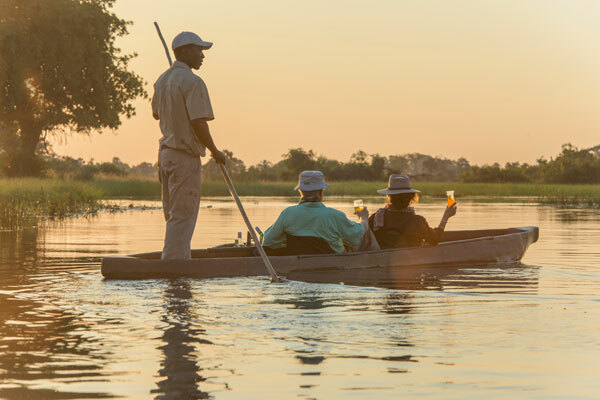 Water levels fluctuate with the seasons, but when the water is at its highest many camps will offer the chance to wildlife view from a traditional mokoro canoe. Not dissimilar to a punt in Oxford or Cambridge, your guide will pole you silently through the water while you watch the wildlife and scenery slip by. As the sun dips towards the horizon it’s the perfect setting from which to enjoy an early evening drink. 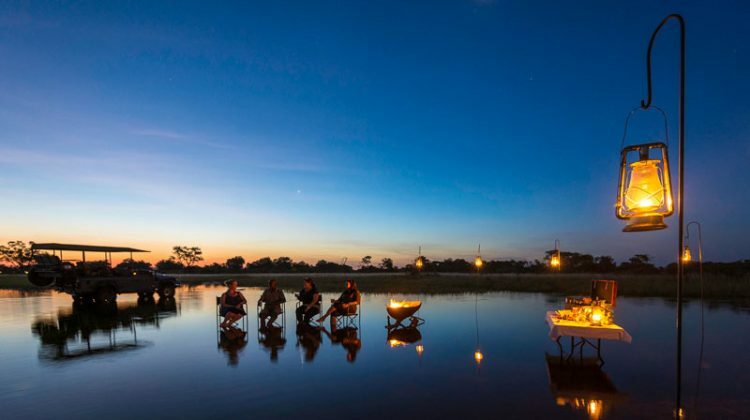 You might alight on a little island, or perhaps, as in this image from Xigera Camp, enjoy a ‘mobile’ sundowner. Malawi’s eponymous lake offers a range of exhilarating activities and a few days here combine particularly well with a safari in Zambia. 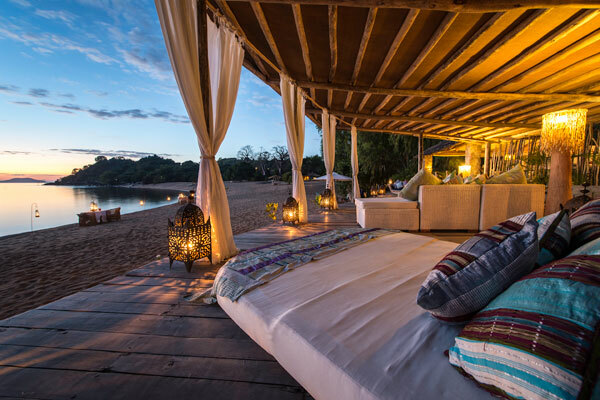 Kaya Mawa, on Likoma Island in the middle of the lake, is one of a handful of lovely lodges here and a pre-dinner drink, sitting by the gently lapping lake, is a great way to start the evening. Though you won’t spot any big game as you enjoy your drink, it’s a heavenly spot to reflect on the days’ activities. One for the romantics or honeymooners this. 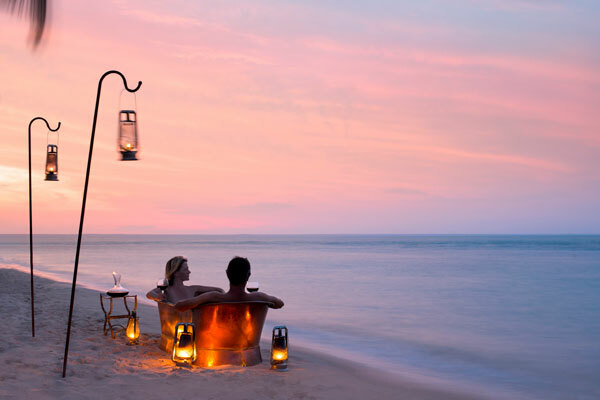 If you’re not so keen on the bath, then the staff at Benguerra Island just off the Mozambique coast will happily provide a more conventional beach-front setting for your sundowners. In total contrast to the verdant green of the Okavango Delta, the Makgadikgadi Pans’ sands are a white shimmer broken by the occasional clump of desert palms. This other-worldly, starkly beautiful landscape is home to more wildlife than you might think and is a wonderful addition to a Botswana safari. When it comes to sundowners it’s one of the best – stars brighter than you could possibly imagine and so quiet you’ll hear your heart beating. 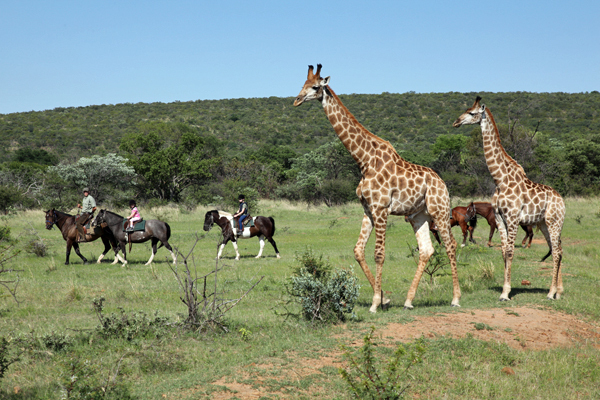 Among camps offering safaris here are Jack’s Camp, San Camp and Camp Kalahari. 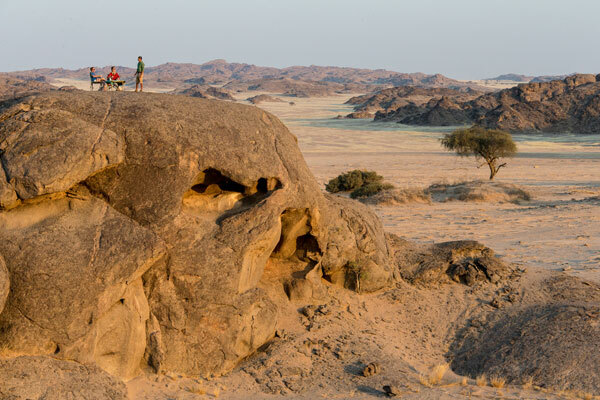 For a desert country there’s a surprising amount of scenic variety in Namibia. Whichever bits you choose to explore you’ll be spoilt with wide open space, dancing colours and some of Africa’s best vistas. You could stop for a sundowner every hour and marvel at something new. 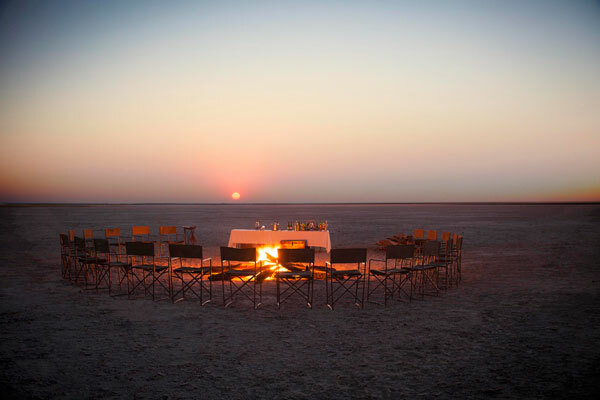 This rocky outpost, a sundowner favourite at Hoanib Camp, is one of the most spectacular. Zambia’s credentials as a safari destination are hard to beat: wonderful wildlife, ever-changing scenery, some of Africa’s best guides, and a great variety of safari activities to boot. It is where the walking safari was pioneered and is still a top spot for those wishing to explore on foot. 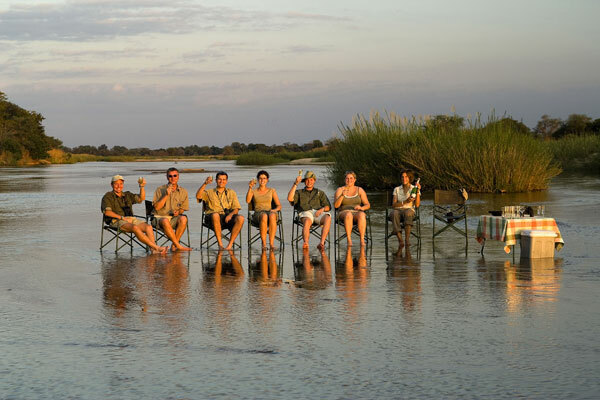 It’s fitting that you’ll often enjoy a sundowner here by the river, or even, as in this case at the end of a day with Robin Pope Safaris, in the shallows where you can soak the dust off your feet. The famous wildebeest migration lives up to its billing as one of Africa’s most spectacular wildlife events. As the plains fill up with these great herds, so the predators follow. 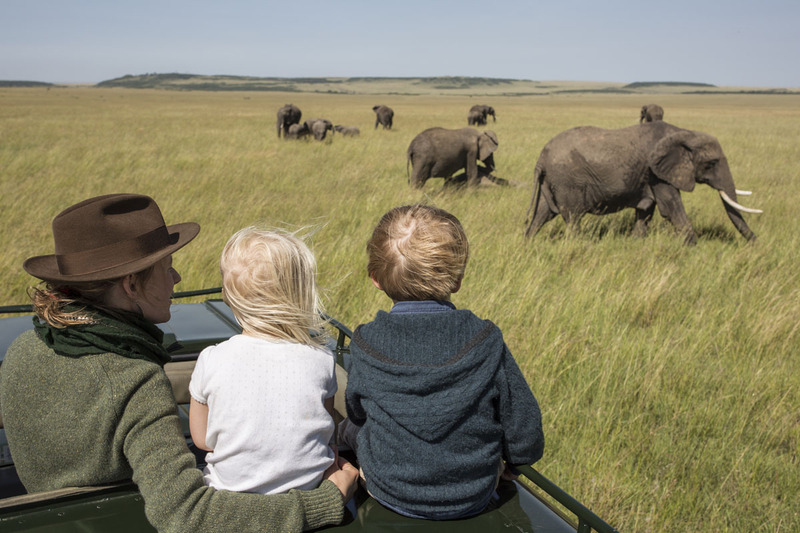 The inevitable skirmishes that result are the stuff of wildlife documentaries and, for those lucky enough to witness for real, are the highlight of many a safari holiday. 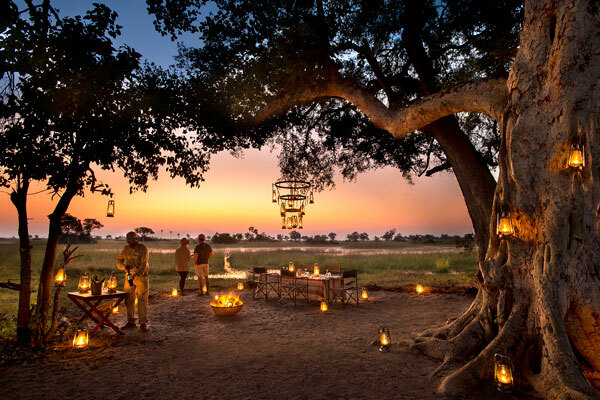 You won’t have to venture far to find a sundowner spot from which to watch the action here, as summed up in this picture from Elephant Pepper Camp. 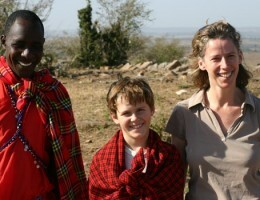 Following Africa’s wildlife from the comfort of a mobile camp is one of the most wonderful ways to experience safari. You have the flexibility to explore at leisure, stopping to spend time where you want. Camp will be pitched to make the most of beautiful locations and wildlife densities. 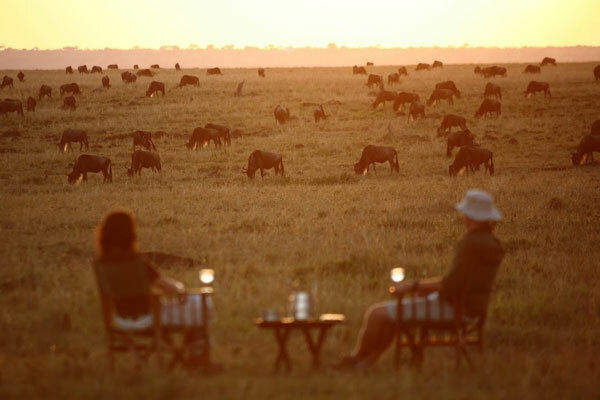 Sitting with a drink without anyone else for miles around it one of those very special African experiences. Mobile camping safaris can be arranged in Botswana (this shot was taken on an &Beyond Expedition safari in Botswana), South Africa, Kenya, Tanzania and Zambia. There are views, and then there are East African views. 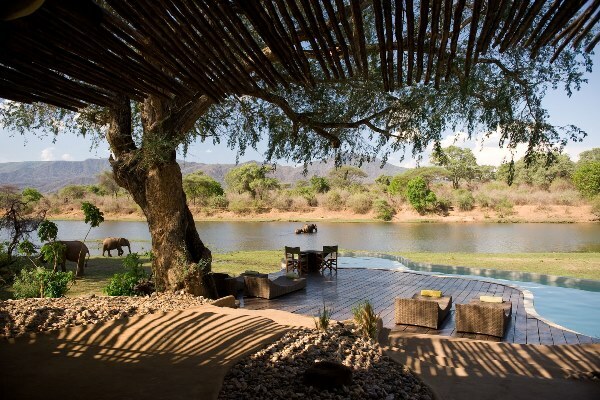 This stunning spot, favoured by Saruni Samburu, overlooks the wild Samburu Reserve and out towards Mount Kenya. 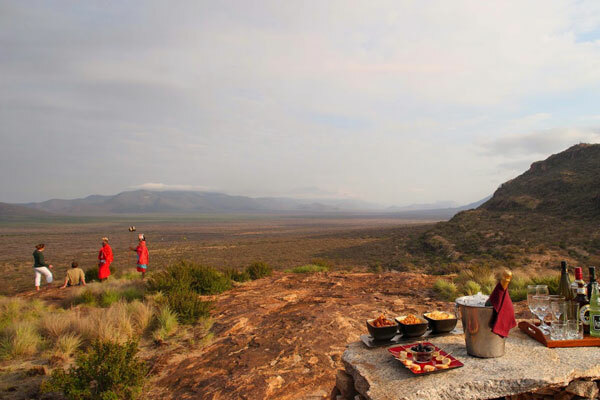 It’s a sundowner spot par-excellence and accompanied by your Samburu warrior guides is a great place to learn the cultural history of the area as well as the animal residents while enjoying a cold drink.